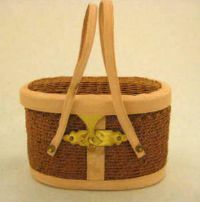 The Body Form is handmade by Nelly Valentino. 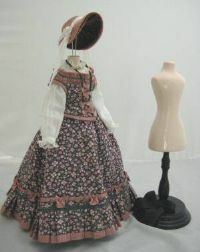 Dress from an Alice Leverette kit and hat 036UF for display only. 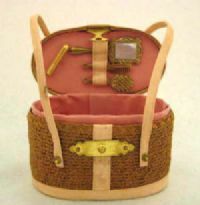 Kit for this ladies necessaire include all the materials needed to complete this wonderful little accessory which would be the perfect size for your 12" FF doll. I taught this workshop at the National Convention in Chicago. All the necessary prep work has been done including the straw pieces. Leather strips have been cut to the proper width and scored on both sides. All other pieces have been cut to shape or size. Very easy to complete as all the busy work is done! Just a few kits left.